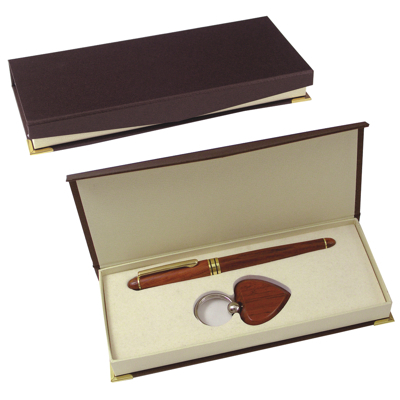 This beautiful Rosewood Gift Set includes a ball point pen and heart shaped key ring and arrives in an engravable gift box. Perfect for any type of gift giving this set is a classic. The Key Chain comes complete with a silver-toned split ring for easy access to keys and removal of the Rosewood Pen cap will reveal a smooth writing rolling ball pen tip. Dimensions Gift box: 7-1/2" x 3" x 7/8"